Some time ago I studied some households living in multi-dimensional poverty conditions in various states. I spent a considerable amount of time with all the members of the families, and accompanied working members to their places of work. I tried to understand their desperate livelihood strategies, their external environment, their needs for financial services, and their access to social protection. I am sharing some selected stories here. Fourth of such stories relates to the household of Mathiben Garwal. Mathiben does not know her age, but suggests on persistent inquiry that she may be about 40 years of age. She lives with her husband, Savjibhai, three daughters, aged 16, 13 and nine years, and two sons, aged 20 and five years. She has one more daughter who is married and lives in another village. Mathiben and her husband are illiterate. Their elder son studied up to third standard and now migrates to Vadodara for work. Younger one is not admitted in the school so far. Daughters never went to school at all. Mathiben’s family lives in a house made of mud and bricks. It does not have a toilet but has an electricity connection with two plug points. They have bulbs but no fan; have some basic kitchen utensils and six wooden cots. They do not have a cycle, radio or a television. Mathiben cooks on a clay chulha (stove) with firewood collected by her and the children during the day. Her household has agricultural land but neither she nor her husband knows its exact measurement. She points out this is the land you see. Records show that she has six bighas of land. Her husband’s elder brother expired some year back without getting married so Savjibhai inherited his share also. Their entire land is at a higher level with low soil depth due to continued water and wind erosion. There is no means of irrigation and they grow only maize during monsoon. Earlier when Mathiben was also migrating with her husband they did not have any livestock but they acquired a buffalo when she stopped migrating. They do not have bullocks and hire bullocks from neighbours to till their land. As the agriculture is rain-fed and there is no other work in the village, Savjibhai migrates to Vadodara to work as unskilled wage laborer on construction sites along with his elder son. His son is also unskilled and seeks casual employment at Vadodara. They remain in Vadodara as long as they keep getting work. Duration of their stay at Vadodara can extend up to five-six months. Sometimes they have to come back in fifteen days only. They however make sure to be present at the time of sowing and harvesting their fields. Mathiben also used to accompany her husband earlier but does not do so any longer, as her health does not permit her to undertake strenuous work in Vadodara. She looks after the agriculture in absence of her husband, tends to the cow and collects firewood with the help of her children. Her husband and the son get INR 100 to INR 120 per day depending upon their bargaining situation. After a month of stay they are able to bring home about INR 1,500 to 2,000 as they get work for about fifteen days on an average in a normal month and have to spend on their food while staying at Vadodara. Stay at Vadodara is treacherous. I visited their make-shift colony at Vadodara which is on an open space belonging to the Municipal Corporation of Vadodara. Hundreds of tribal families migrating from different villages share that space with about 25 families from Kankari Dungari village. The adult members leave for work or in search of work during the day, while their children play in the dirt and garbage of the colony. Elder children also look after their younger siblings, feed them during the day and collect firewood from far away places for cooking. None of these children goes to school which is anyway neither feasible nor possible in the given conditions. All the families live in a small patch of land enclosed by polythene and jute sheets. Even the roofs do not have any hard material. The entire structure is supported by the wooden sticks. The structure is obviously not suitable for a human habitation in any weather. There is a municipal water connection for one building under construction on one side of their colony, which is used by all the families staying there to meet their drinking, bathing and cleaning needs. The colony does not have any toilet or bathroom facilities and the inhabitants use one corner of the land plot for these purposes, which makes the entire place even more inhabitable. Women have to finish off their morning routine while it is still dark. They also have to take bath hiding themselves behind their houses in the open. None of the families staying in the area has been issued ration cards and they have to depend on the local shop keepers for procuring their daily provisions. They do not avail of medical facilities at government hospitals, as according to them whenever they tried to do that, they were made to run around from pillar to post, and did not get any medicine even after wasting much of their time. They go to the private clinics when they fall sick and have to spend a large part of their earnings on their healthcare. Their unhygienic living conditions appear to be one of the major reasons for their falling sick. As their agricultural land produces only one crop, it does not meet the food requirements of the household. According to Mathiben that is precisely the reason why her husband migrates along with her son. Maize produced at the field suffices for the household food grain requirements for about eight months. Sometimes when there is an emergency they have to sell maize after harvesting and purchase later at more than double the price. Mathiben had to resort to selling maize recently when her younger son got sick. She did not have money and her husband and the elder son were in Vadodara. She had to spend about INR 2,000 on his treatment. As two members of the household migrate to earn and the family has access to the subsidized Public Distribution System (PDS) food, there has been no episode of hunger in recent past. Agricultural land only produces maize and hence Mathiben needs to purchase other provisions such as lentils, vegetables, cooking oil, sugar, salt, and spices from the market. She buys smaller quantities of the provisions at the village itself. For larger quantities she travels to Limkheda paying INR 7 as one-way fare. They buy clothes for children and themselves during the marriage season and spend about INR 2,000 at a time. The major expense is however on chandlo, which is about INR 10,000 every year. Other expenses include buying shoes, soap, hair oil, tobacco and alcohol. They did not report any substantial expenditure on entertainment although the elder son gets to watch some movies in Vadodara. Mathiben’s household did not experience any major income shock in the recent years. She managed the marriage of her daughter without having to borrow money from outside. Whenever the father and the son come back from Vadodara, they have cash and for want of any suitable savings mechanism they keep it at home. Their expenditures are generally small and frequent, excepting on medical care and purchasing food grains in bulk. Practice of keeping cash at home thus addresses their liquidity requirements but is very risky at the same time, as the nature of construction of their house does not make it a safe place for stashing cash. Being illiterate, the formal savings mechanisms, especially the banks, intimidate them. Even if they overcome their inhibitions and deposit money in the banks, high frequency of their transactions will entail significant loss of their working hours. They therefore need a savings mechanism where they can frequently deposit and withdraw small sums without having to waste their working hours. They also need to borrow money at regular intervals for various purposes. What was however remarkable is that the villagers do not want to talk about their debts. They also do not view their debt in totality. Debt does not seem to be an independent entity but appears to be subordinated to its purpose. Inquiring about debt in itself generally evokes a negative response. It is only when the question is about the amount of debt for a particular purpose; the amount of debt is revealed but is limited to that particular purpose. Unless one exhausts all the purposes, the situation of indebtedness is not understood totally. Indebtedness situation of a household starts becoming clear only after the first interview, and its fuller assessment requires at least two to three subsequent interviews. Loans may be taken against some collateral or without collateral. Lending rates for collaterized loans range from 36% to 60% per annum, while there were instances of some non-collaterized loans attracting an interest rate of 150% per annum. At least one instance was reported with an interest of 25% per month on a loan amount of INR 2,000 availed for medical purposes. The most important purpose for obtaining a loan is a medical condition followed by meeting the expenses on chandlo, agricultural investments and the expenses on life-cycle events such as marriages and deaths. Mathiben’s household spends about INR 10,000 on chandlo every year. Whenever they do not have cash to pay chandlo, they borrow it from outside. Mathiben had borrowed INR 1,500 just before my first visit to her household to pay for chandlo, which was organised by her immediate neighbor to construct his house. She however did not need to borrow any money for the marriage of her daughter and it was managed with the amount of chandlo and the dowry her daughter received. She normally borrows money from the shopkeepers at Limkheda. Responding to a question as to why she does not borrow from a bank, she mentioned that banks give loans against the jewellery as collateral and she does not have jewellery to offer to the banks. She also felt that obtaining a loan from a bank is a big hassle and the banks make people run around. Their situation may however immensely improve if they have an access to a reliable and reasonably priced credit mechanism. The earning members of the household travel far for their work and are also engaged in employments not providing them with any security. They therefore need to be insured against accidents and death. The household also needs suitable insurance services providing coverage to their health and assets. As Mathiben’s husband and son migrate out of their village, they need reliable remittance services so that they do not have to personally come back to the village for delivering money to her. A self help group (SHG) was earlier functioning in the village that had membership in her locality. She was however not a member of the SHG as according to her, only old women were made members. She further mentions that the SHG could not function for a long time as its leaders took away the savings of the members. All its activities were controlled by Mohanbhai, husband of the president, as he was the only one who was educated (till class 7). The SHG received a subsidized loan for buying a grain grinder which was installed at the president’s house. She promised to serve the members at half the usual rate but did not keep her promise. Savjibhai was persuaded in 2002 by an agent of life insurnace corporation (LIC) at Vadodara to purchase a life insurance policy carrying a premium of INR 900 per annum. He deposited the amount for two years but did not continue it as he could not arrange for the premium amount timely. In the process he lost out INR 1,800 in addition to the insurance cover. Whenever he and his son have spare money at Vadodara, they keep it with their employers as it is not safe to keep it at their place in Vadodara. They get it back when coming back to their village. Sometimes they lose their money (they remember losing it on three occasions earlier, when the employers refused to accept that the money was kept with them) but keep following the same mechanism for want of any alternative. They do not explore the option of saving their money in a bank at Vadodara as they feel that no bank will open their account at Vadodara. On probing deeper, Savjibhai admits that he would not want to open an account at Vadodara as he does not know and trust anybody there other than his employers. Being illiterate, he can only transact with people who he trusts and not on the basis of some pieces of paper. Savjibhai is however willing to put his savings in a bank if it is available in his village and the product suits his requirements. He feels comfortable with the post-office as he knows the postal personnel in the neighboring village Dantia. He however wants either the post-office to readjust its working hours or collect his savings at his doorstep. Mathiben’s household has been issued an Antyodaya ration card. She is accordingly entitled to receive 16.7 kg wheat flour and 16 kg rice on payment of INR 86. According to her, she only gets 5 kg of rice. Moreover, the wheat flour she gets most often smells foul and is infested with insects. She feeds it to her buffalo. She has an option of buying 3 to 4 pouches of edible oil but is able to procure only 1 or 2 pouches, as she does not have enough money to buy it at one go. One pouch costs her INR 45 at the PDS shop, while it costs about INR 90 in the open market. Mathiben, her husband and her son have been issued job cards under national rural employment guarantee program (MGNREGA) but they had got no employment till the time of my last visit to her household. Four items of work were sanctioned in the village under the programme and were ongoing during my visit to the village but they all related to digging wells at private fields. The concerned field-owners themselves decide who to be employed for work. They therefore usually employ people from their own households and their neighbors. Mathiben mentions that ‘the employment goes to the family members only; who will call us’. She is not aware of the provisions of guaranteed employment under the program. Mathiben is not able to procure her entitled quantity of edible oil for want of money and she has to buy the additional quantity at almost double rate from the open market. Thus she needs access to small credit to be able to claim her entitlement in totality. Mathiben could marry off her daughter without having to borrow money from outside with the help of chandlo amount she received from her community members and the dowry she received from the groom’s family. She is also not unduly bothered about arranging the money for the marriages of her other children unlike her counterparts in UP. Institution of chandlo thus takes care of the financial needs for the lifecycle events concerning her household. Most households in tribal villages of Dahod district live near or inside their fields. 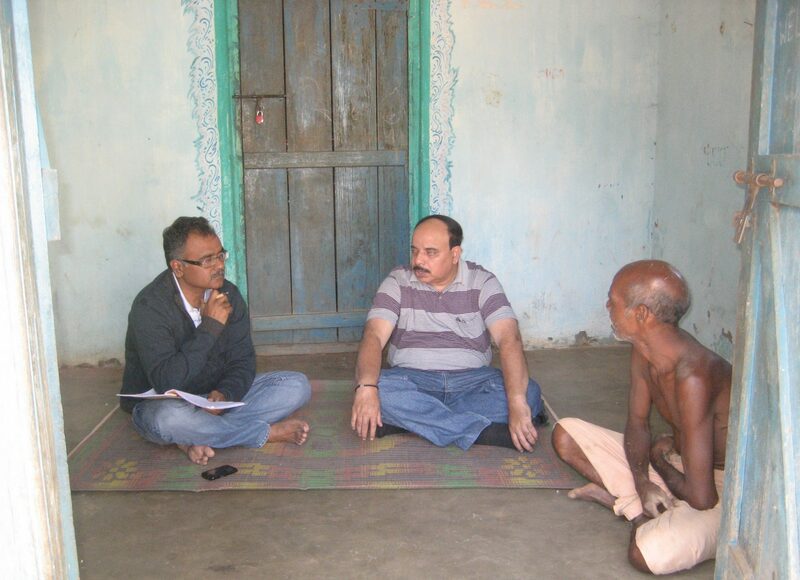 Chandlo: a community financial institution in tribal areas of Gujarat. Life-cycle events such as marriages and deaths entail large amounts of expenditure but in most cases it gets managed with the money collected through a custom called chandlo vidhi. Chandlo is monetary contribution that relatives and other community members make towards the expenditure a household is incurring on a funeral, marriage, or other social occasions. Although such a custom is prevalent in other parts of India, but it is always at a much smaller scale. Here, the contribution may be as high as INR 15,000 on a single occasion. Chandlo seems to be the community’s response to a deficient financial-especially savings and credit-infrastructure, based on trust and mutual dependence. It harnesses the social capital of the localized tribal community to facilitate all its members to adequately celebrate social occasions. In effect, it works as a savings mechanism to be encashed at the time of need for a lump sum. If some households do not have a social occasion for about five-six years, they organize a chandlo with some other purpose, mostly construction or upgradation of their house, to recover the money they contributed as chandlo to other households. It has, however, started getting oppressive now with conditionalities such as the recipient having to pay double of the amount she received for her chandlo, to the chandlo– organizing household. Such amounts over a period of time become very large and many households have to resort to borrowings to be able to give chandlo. At least five relatively better off respondents reported that they migrate to earn money to be able to pay chandlo. If it was not for chandlo, they would never migrate. Continuously increasing amounts of chandlo also raises the levels of expenditure incurred on their life-cycle events. Some resistance seems to be building up against the oppressive forms of chandlo. He has since expired. Interestingly, nobody in the village was willing to speak about the SHG and Mathiben was the first person to provide some information that was corroborated by the others in subsequent interviews. The closure of the SHG seems to have generated substantial amount of suspicion and distrust within the otherwise largely closely-knit village community, and they do not wish to acknowledge or talk about it. They are vulnerable to be cheated in other ways too. They are illiterate and save different amounts irregularly. In case of taking their money back after four-five months, it would be difficult to accurately calculate their total savings. A dishonest employer may be tempted to take advantage of this situation. This entry was posted in Uncategorized and tagged Livelihood Strategies, Livelihoods, Microfinance, poverty, Public Distribution System, Push Migration, Rural India, Seasonal Migration, Self Help Groups, Social Protection, Tribal migration on July 28, 2016 by Dr Anurag Priyadarshee.